We’ve taken t-shirts, balloons and pens, and made them our own. Remember: before browsing our range create an account or login. If you're a Supporter, please sign in and browse our range of merchandise, then call to discuss your ideas. 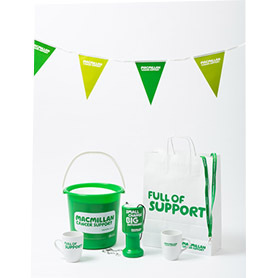 If you're a Staff member or Macmillan Professional, you can view and order merchandise when you're signed in to your account.